The premise is a standard horror trope: creepy people have secrets locked away in the basement of their creepy house. The filmmakers could run with this in many directions but unfortunately they took a wrong turn when they decided to throw a pinch of horror into a stew of romance. There is a lack of anything scary and when something spooky is on the screen it lasts for less than ten seconds. The whole beginning section of the film, before the mansion is even introduced, is akin to a Broadway musical without the singing and I was getting antsy. I thought to myself, “Surely this will pick up and my horror-sense will start tingling.” At times I was close to falling asleep but the actors’ efforts were respectable and it wasn’t their fault, they just happened to be trapped in dully written characters. Eventually, an old man gets his head bashed in and as a result my senses heightened as I welcomed the end of the dry spell. The mansion is finally revealed and what a wonder it is! The first thing to notice is that is in the middle of nowhere, a dark blemish in a barren field with a reddish-brown clay trail running from the entrance gate all the way up to the front steps. Upon entering, a chill runs down the spine, maybe from the gaping hole in the dilapidated ceiling or possibly from the unnerving color palette of the walls and grand staircase. A closer observation reveals a sappy, blood-red substance seeping through the cracks of the interior. 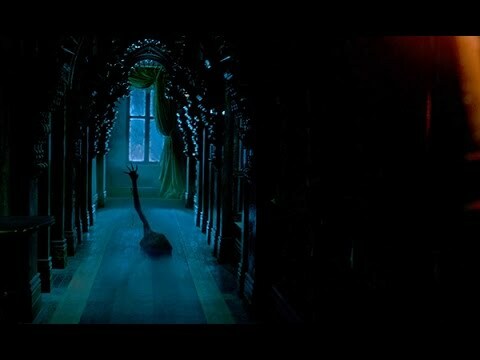 This was truly the most excellent aspect of the film, along with the lavish and vibrant costumes. It was at this point I assumed the gushy nature of Crimson Peak would shift into pure terror and all would be right with the world. Certainly, it couldn’t be all ambiance and no substance! I was disappointed. I found many things not up to snuff. 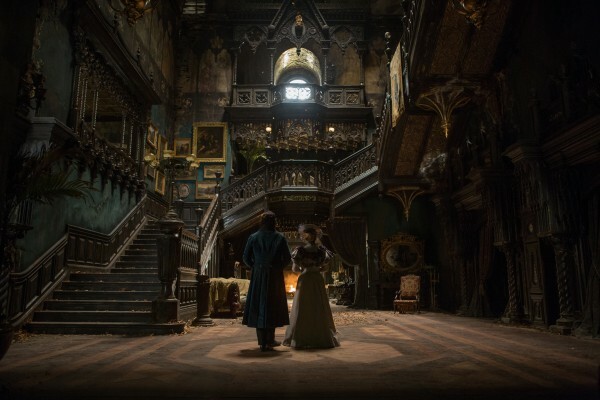 Crimson Peak‘s story’s details are bland and typical, with every twist as predictable as the next. Without going into spoiling detail, a lot of different things bothered me, like the protagonist’s reaction to things. It is a flimsy proposition that someone would still show love and sympathy towards their significant other, even after finding out about all of the horrendous activities they are involved in. Any scene with an apparition chasing the main character (all two or three of them) would lead to a puzzling follow-up were her mood would drastically change after leaving the room, like she wasn’t frightened to death a few moments earlier. Why wouldn’t the tortured souls attack their enemies directly instead of trying to intimidate an innocent newcomer to the situation? Despite being featured prominently in the ad material, Charlie Hunnam’s (Pacific Rim, Sons of Anarchy) character does little of anything throughout the entire film, even when he has his time to shine during the finale. Don’t even get me started on how the director, Guillermo del Toro (Hellboy, Pan’s Labyrinth, Pacific Rim), dispenses a cheap recycling of ideas. The entire concept seemed to be borrowed directly from a screenplay he wrote in the not too distant past. Don’t Be Afraid of the Dark is also about people moving into a scary old mansion with a terrifying basement and a dark secret; the only difference being it’s ACTUALLY INTERESTING AND SCARY! The whole nightmare house cut off by inclement weather scheme seems stolen from The Woman in Black. Even in the last scene del Toro felt the need to duplicate the floating blood special effect from what some would call his defining film, The Devil’s Backbone. I can say quite confidently that Crimson Peak has nothing in it I haven’t seen before. About as morose as the main setting, I left the theater with a solemn scowl on my face. I felt cheated; tricked by borderline false advertising. Were my expectations too high? Possibly. I shouldn’t have let my affinity for the director preempt my experience. I shouldn’t have bought into the hype. 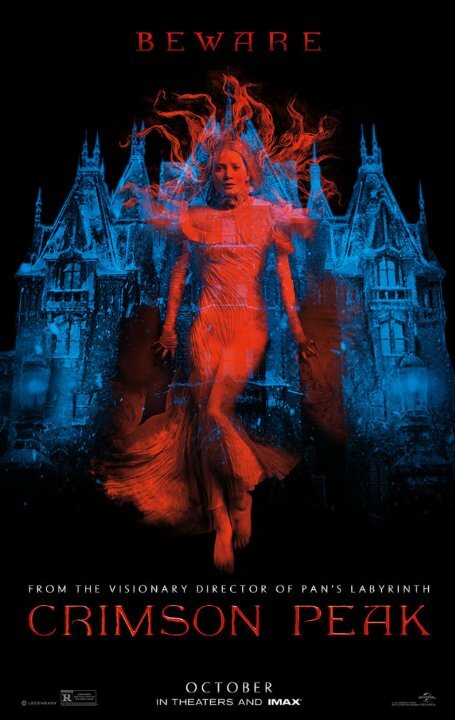 I shouldn’t have presumed Crimson Peak would be the newest addition to the ever-growing pantheon of modern horror instant classics. This entry was tagged Charlie Hunnam, Crimson Peak, Don't Be Afraid Of The Dark, ghosts, Guillermo del Toro, Hellboy, Horror, MASSACRE MARATHON, Pacific Rim, Pan's Labyrinth, Sons Of Anarchy, The Devil's Backbone, The Woman In Black. Bookmark the permalink.